18+. New customers only. Minimum deposit amount is €10. Bonus amount needs to be wagered 30x to be able to cash out winnings. First deposit must be made within 7 days after registration to claim the bonus. Unused bonus expires in 60 days. T&Cs apply. Yukon Gold Casino is a mid-West themed online casino with an impressive set of features available for its members. The casino has over 311 online casino games including online slots, video poker, table and card games. There are even 18 Progressive Jackpots on 23 different games! The casino also prides itself for offering an average payout rate of over 97%, which are better odds than many other online casinos. 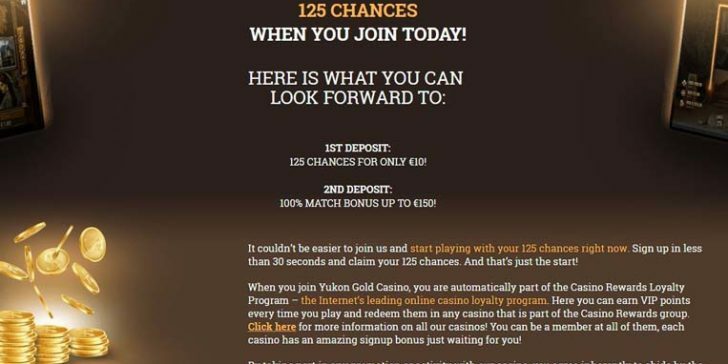 Yukon Gold Casino is part of the CasinoRewards group, so it’s a trusted site with quality player support! 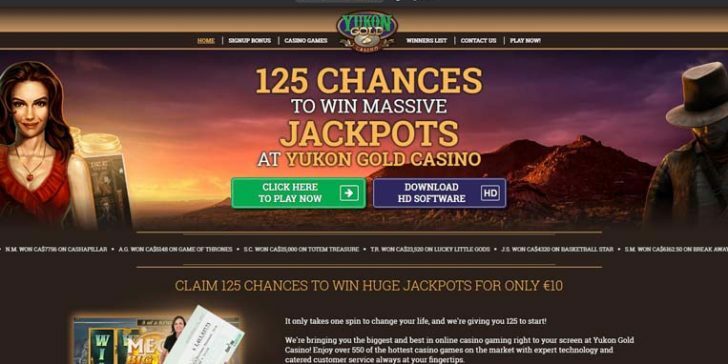 Since its launch in 2000, Yukon Gold Casino has changed it appearance and bonuses several times. Currently all new members get treated with 125 chances for only €10 first deposit. The second deposit brings 100% up to €150 match bonus! The site also runs regular weekly promotions through CasinoRewards’ network-wide competitions and offers a great loyalty program that gives players a little back on every wager they make at the casino. CANNOT gain access in order to have my 160.00 dollar win forwarded.Require an explanation please. Perhaps I am repeating myself but will my 160.00 dollar win be posted to my credit card account as previously stated. That is within they two day business period. No excuses thank you.